We have come far, grasshopper, in studying the Trait-fu. We know to pick Traits essential to the core truth of the character – because that’s how we’re going to shine. We’ve learned to be careful that the scope of the chosen Traits isn’t so narrow as to be seldom usable, but also isn’t so wide as to be abusable, usable almost always. Now we focus in on the gravy – picking Traits that enhance the flavor and savoriness of each selected Trait, bringing the overall character to a tasty fruition. Pushing on, this aspect of Trait selection is all about texture. And successful texturing will help determine if your character pops three-dimensionally, firing on all cylinders – or if instead the character has as much vivacity as a dead mackerel, lying inert on the deck. Your character’s traits are the main way that the audience sees them try to surmount the obstacles in their path. Not only do the Traits represent what we see the character doing the most often, the Traits are what we see the character doing when things are at the most dramatic, as the audience waits with baited breath to see what happens next. Put another way, whenever the character is in the spotlight, odds are that the character’s Traits are front and center. Perceptive, Dichotomy Powers, Clever, Handsome. Those Traits certainly function well enough. They do represent the core of what we want to see the character do, and they aren’t too narrow or too wide. But they’re so meh. So forgettable. Invoking these Traits just might put us to sleep! Bam! Each of the above pretty much accomplishes the same coverage as the first bland set, but the difference should be obvious. Which is going to make you feel it more, invoking “Handsome” or “Built Like a Greek Statue”, to charm the coed? Which is going to push shaping the narrative more, “Clever” or “Sharper Than He Looks”, when trying to solve the puzzle in front of those who don’t see him that way? Which gives us a more meaty sense of the character, “Perceptive” or “Doesn’t Miss Much”, when checking to see if the character spots a clue in the undergrowth? It is tempting to choose the bland Trait and have done with it – these generic concept labels come so easily to mind – Strong, Rich, Shy, Athletic – and let’s face it, everyone wants to get the character creation part over so that they can starting gaming. But take a few more moments. Your whole game experience will center on your character’s four Traits. Make sure to choose the right ones, full of flavor, and you will not be sorry. Choose the easy and bland ones instead, and you may well wonder why the game falls so flat for you. So take the time to pick “Nervous Around Others” or “Socially Awkward” instead of just “Shy”. It will help bring your character to life. Choose your character’s core truths – the main things we the audience love about the character, or what fascinates us. Make sure your selections aren’t so narrow that they are rarely able to be used, nor so wide in scope that they can be invoked practically anytime. Finally, choose carefully, avoiding bland “concept-words” selecting instead Traits that are filled to the brim with attitude, life, and flavor. Your gaming experience will thank you for it. We talked last week about selecting the right Traits for your shiny new PC – traits that embody the aspects of the character that we the audience want to see the PC embrace time and time again. However, there is another critical issue in traits selection that GMs must pay close attention to – the Goldilocks Principle. It’s about Trait utility. Here are two very different examples to demonstrate what can happen if the GM approves Traits that run afoul of this concern. John is a player who loves playing powerful, effective characters, so right out of the gate he tells the GM that he wants one of his Traits to be just that: “Powerful”. John argues that his character is a rich and influential businessman who exudes power, and that this Trait encapsulates that. Sam has a very different character – a street level loner who lives by his wits, and gets out of scrapes not by money or power, but by sheer willpower. Sam wants to take the Trait “Determined” to represent how his character through grit and resolve surmounts his obstacles. But the purpose of a Trait isn’t just to give the players dice any time they want – it’s to give them dice in circumstances where their Traits make sense . This means that there will be times when you can invoke a Trait, and others where invoking a Trait isn’t possible. A Trait of “Golden Gloves Boxer” isn’t (one assumes) going to be generally invokable when trying to notice a clue at the crime scene. However, once the villain is uncovered, that Trait would be great for taking them down. The problem with “Powerful” (and in a more subtle way, “Dedicated”) is very simple: When don’t they apply? Because a Trait that can almost always be invoked regardless of the nature of the Outcome Check isn’t so much a Trait as a request to always have extra dice available – and that is not what Traits are for. The solution is simple. 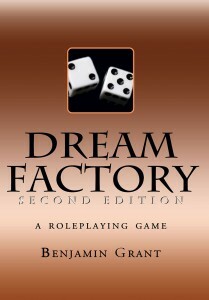 As a Dream Factory GM helping players make new Traits, ask them one question: “When can you not invoke this Trait? When does it not apply?” If they cannot answer that question satisfactorily, the Trait should not be approved. This of course does not mean that the core thought that John or Sam had above can’t be encapsulated in a more well-defined Trait – assuming that said core thought wasn’t just the desire for more dice more often. Perhaps the GM can suggest some less abusable alternates for John, such as “Wealthy Venture Capitalist” or “Alpha Male Personality”, depending on which John was going for – or maybe John would want one of each. Perhaps for Sam the GM may recommend “Never Gives Up” – or even simpler, allows the player to take “Dedicated”, but makes it clear that it’s invocation for an Outcome Check will only be approved only when a test of mental or spiritual resolve is called for. A Dream Factory GM should also be aware of the opposite problem, which happens more rarely, but does happen. Sometimes a player grabs onto a Trait idea that seems like a cool idea at the time, but winds up being so narrow in scope that it very rarely gets used. For example, a player trying to make a character in game centered on mummies and Egypt might get the idea to have a Trait like “Speaks and Reads Ancient Egyptian”. However, the GM should ask themself if that Trait have enough opportunity for use – not just in one episode, but in each episode of each season of this game? With a Trait that narrow, probably not – so the GM should help the player widen it out, perhaps suggesting alternate Traits that would include the use of the original idea, but fill it out so that it can have more use. Perhaps “Egyptologist” or “Archaeologist” could include the desired effect in a less limited way. So, we have covered two mandates: make Traits enhance the character concept and don’t make them too wide or too narrow in scope – but there’s one more key to picking (or approving) Traits that really make characters soar and pop – and that will be covered in the third and final installment of this series. The standard way to win an OC – apart from being lucky, of course – is by leveraging (that is to say, invoking or risking) your character’s Traits to get extra dice, so obviously choosing the right Traits when building your character is critical. However, all too often we are tempted to hurry through the process of Trait selection to get right to playing the game – and this is not the kind of game where you really have to spend oodles of time in character creation – but that is not to say that you shouldn’t make careful and well thought out choices. Your character’s Traits are where that should begin. The key in selecting Traits is to pick ones that represent what we as the audience want to see the character do time and time again. A gumshoe’s deductions. A cat burglar’s stealth. A hero’s rectitude. A rogue’s bad attitude. The Traits you pick are not only the way you will win Outcome Checks, but since they are the main way you can win OCs you will be regularly bringing those Traits into play in the story itself, so it is vital that what you choose for your character’s Traits are the aspects of the character that we all want to revel in. Part Two of this series will focus on zeroing in on the right breadth of Traits, and avoiding one’s that are too narrow or too broad.